Among the many harrowing scenes coming out of Paris last night, it was perhaps not the burning of the Notre-Dame cathedral itself which moved me most. Instead, doing the rounds via an eyewitness video, it was a small gathering of onlookers who had united in solemn song, chanting the Ave María as their city’s most historic landmark smouldered on the other side of the Seine. Here was a congregation in its purest form. Outside four walls, but worshipping together with the same earnestness of any mass. The fire is suspected to have started around 6.30pm, in an area at the rear of the cathedral where restoration work was being undertaken. Once the fires were quelled – over six hours later and through the efforts of nearly 500 firefighters – it was confirmed that the 855-year old medieval church had lost its roof, windows and 750-tonne spire. Many of Notre Dame’s relics and artworks are reported to have been saved, however, along with its famous twin towers. His words got me thinking about our collective stake in cathedrals. Having recently been in Hamburg where the bombed-out shell of the St Nicholas church stands as a memorial to the past, it is clear how viscerally they still embody the souls of our cities, in whatever state of repair they may be and for whatever communities flock to them. Few images provide a better symbol for London’s wartime spirit than the photo of St Paul’s looming through the smog in the early days of the Blitz. With that in mind, I hope the world will respond with open hearts to President Macron’s pledge to rebuild the Notre Dame via international subscription, to which the billionaire owner of Gucci and Yves Saint Laurent, François-Henri Pinault, has already pledged €100 million. His call is a timely reminder that when the chips are down, there is much more that unites than divides us. Shamima Begum will be granted legal aid to fight the decision to revoke her UK citizenship. The 19-year old is expected to plead her case before the semi-secret Special Immigration Appeals Commission, which hosts UK nationals stripped of their citizenship on the grounds of home security. Begum joined Islamic State aged 15 and had her citizenship revoked in February after she was found in a Syrian refugee camp. Libyan prime minister Fayez al Sarraj has warned that more than 800,000 migrants could flee to Europe if instability in his native country is not addressed by the international community. Speaking to Sky News, the UN-backed leader suggested mounting terrorist attacks led by General Heftar, a warlord formerly loyal to Colonel Gaddafi, were the root of the crisis in Libya. He confirmed his government’s intention to seek armed resistance if necessary. Goldman Sachs has predicted that President Trump has a “narrow advantage” to win re-election in 2020. The bank, which yesterday reported an 18% fall in profits during 2018, said the president would benefit from continuing robust economic conditions in the US, a large pool of potential Democratic opponents, and first-term incumbency. Presenting its full-year results, Goldman Sachs also said it had cut employee remuneration by 20% in the first quarter of 2019. Legal & General has warned that shareholders may begin to withhold public investment unless business faces up to the coming “climate catastrophe”. Climate change topped the firm’s annual list of leading concerns around company management, which also included the level of executive pay, lack of diversity in corporate roles, the role of political lobbying, and auditing. It cited a 37% increase in opposition votes to the re-election of certain companies’ directors during 2018 as evidence of its increasingly strong stance towards organisations where it holds shares. The UK has been named as the top investment destination in the world by Ernst & Young. According to an annual survey released by the professional services firm, the UK accounted for 10% of global M&A activity during 2018, worth a combined £305 billion. It is the first time the UK tops the list in the survey’s 10-year history, knocking the US and Germany into second and third positions. A former CEO of Volkswagen, Martin Winterkorn, has been indicted on four charges of fraud and unfair competition over the carmaker’s abuse of diesel emission tests. Prosecutors in Braunschweig, Germany, said Winterkorn had failed to prevent the manipulation of Volkswagen engines that enabled the vehicles to falsify results. Winterkorn faces separate criminal charges in the US. Jet Airways has failed to secure emergency funding from its lenders, raising the possibility that it could fall into administration. India’s second largest airline until recently, Jet Airways was forced to suspend all international flights last week due to debts of more than $1.2 billion, and has now extended its cancellation period until Thursday. The airline’s board is due to meet later today to seek further short-term funding. Poor first-quarter revenues at Goldman Sachs and Citigroup, and a pessimistic mood in ongoing trade talks between the US and China, led the London market to finish on a mixed note on Monday. By close of trading, the FTSE 100 was 0.19 points lower at 7,436.87, while the pound was up 0.2% against the dollar at $1.30 and 0.23% stronger on the euro at €1.16. The FTSE 250 index, meanwhile, added 0.48% to close at 19,807.09. A stronger pound on the euro was propelled on comments by UK foreign secretary during a visit to Japan that ongoing Brexit talks between the government and Labour had been “more constructive than people thought”. Jeremy Hunt recognised Japanese investment in the UK, and confirmed the UK government does “not want no-deal”. In corporate news, advertising giant WPP (up 1.51%) was among the day’s standout gainers following news that it had attracted bids for a majority stake in its data analytics unit, Kantar, from private equity firms Bain Capital, Apollo, CVC Capital Partners, Permira and Apax. Kingfisher (up 1.03%) was hot on its heels, after analysts speculated the B&Q owner could be in for heightened sales during forecast fair weather this coming bank holiday weekend. Mining stocks retreated after a strong session for copper last Friday, leading Rio Tinto (down 1.45%), BHP (down 1.66%), Anglo American (down 2.01%) and Antofagasta (down 1.96%) all into the red. Rio offset some losses after it announced an additional $302 million investment in its green energy offering. 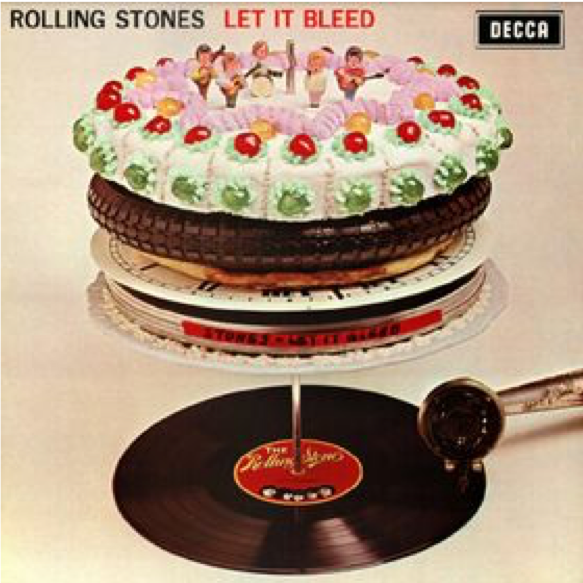 Delia Smith created the cake on the cover of Let It Bleed by the Rolling Stones.